When universal public education became accepted in the 1800’s it has always had a problem of making available funds stretch far enough to cover the expenses of providing a quality education. In the beginning it was not unusual for homesteaders to come together to build a school and to provide room and board for a teacher. Simple solutions were often found to solve educational needs. For example slates were found to be an inexpensive way to help students work on math and writing skills. As communities grew, bigger schools were needed and as more subjects were added to the curriculum there grew a need for textbooks to help teachers provide the latest information in a particular subject. By the 1930’s textbooks had become a staple in most education systems. 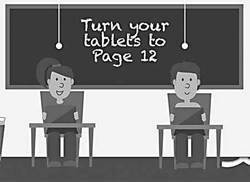 Over the next eighty years textbooks began to eat into many school budgets as the cost of textbooks climbed from less than $20.00 to well over $125.00 and then came the problem presented by the information age! Most textbooks take approximately two to three years to go from concept to a printed book. Often the textbook can be outdated even before the first copy is printed. Even history books can be outdated by a sudden discovery of a diary or artifact. Books that were once replaced every ten years or more now needed to be replaced every five years or even sooner as curriculums were being revised on a shorter cycle than in the past. To counter the rapid increase in textbook costs many school divisions found it necessary to find new ways to generate funds to replace textbooks and soon textbook fees were asset to parents to help in the cost increases. In recent years the fees have reached a point that make it very hard on a family budget. Then in 2010 Apple introduced the iPad to the world and technology was able to address the problem of bringing to students the latest developments in knowledge acquisition. At first e-Readers began to appear that would meet consumers’ need for a quick inexpensive way to acquire novels and self-help books. By 2012 Apple began to address the need for inexpensive and up to date textbooks. Today many school divisions are looking at acquiring their textbooks on line. Textbooks on line have two major advantages over hard covers. First they can be updated instantly and second they are far less expensive. Currently there are two major drawbacks. First is the intial cost for a tablet and second, is the limited amount of textbooks available on line. Overtime both should become less of a problem. Demand should drive down the intial costs and at the same time encourage more textbooks to come on line. The students of tomorrow may not need backpacks to cart twenty pounds of books, but a simple carrying case that hosts a tablet containing all the information a student will need to do their homework. Today most students walk around with a smart phone capable of not only communicating with their friends and family but also able to discover where the best buy for items they need or where the nearest gas stations or restaurants are located. Don’t be too surprised that they are soon doing their homework on such devices.